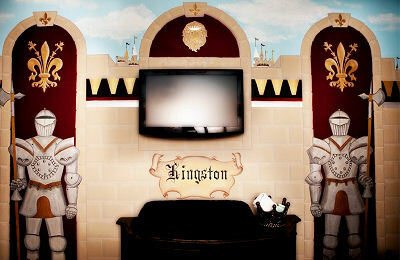 The king's castle baby nursery theme on this page was designed for a little prince who bears a very royal-sounding name; this baby boy's name is Kingston! How perfect is that? As you can see, the walls of this baby boy's nursery are a work of art in and of themselves. At eye-level, the beige colored (faux) stonework of the castle walls provide a beautiful contrast with the black crib and nursery furniture. Above the painted masonry, the upper third of the wall features a painted medieval scene under a painted cloud mural that gives the room a spacious, airy feel. 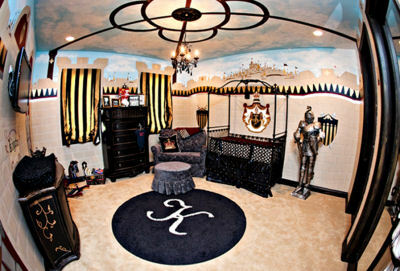 Go here to get medieval decorations for your little prince's room. Two knights in armor standing guard on each side of the changing area are reminded of the royal nature of their task by the crown shaped receptacle holding the little prince's diapers. On the wall above the table is a flowing banner personalized with the baby's name embellishing the impressive trompe l'oeil painting technique and golden Fleur de Lis. The walls of this little prince's nursery bathroom are painted with bold beige and black stripes and accented with a shelf filled with kingly decorations. 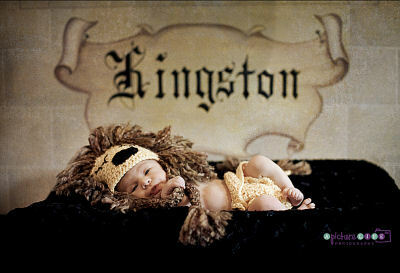 Ashley chose the perfect pose for Kingston's newborn photo shoot. To see more pictures of Kingston's room as well as more of Ashley's incredible baby photo shoots please visit her blog, A Picture Life and, of course, visit Unique Baby Gear Ideas often! 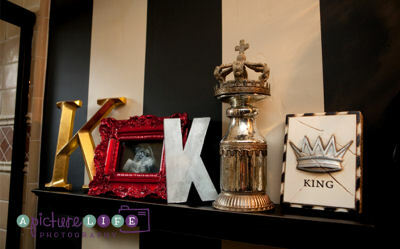 The king's castle baby nursery is a beautiful room and I love the baby's name. i am having a baby boy soon and love the wall art you have behind the baby picture... where did you get it made? That room is incredible! We just found out we're expecting and if we start now I think we can do this without spending too much. Our nursery doesn't have super high ceilings so we will need to scale the wall painting technique down to size. Can anyone tell me if the walls painted or did they use wallpaper for some of it?